The Dow Jones just hit another record high today. And it all comes back to the Federal Reserve. You see, today, Janet Yellen said that the U.S. economy was “robust” and that we should see more rate hikes, along with a reduction in the Fed’s bond portfolio this year. Wall Street took the news to mean that the economy is doing well and nowhere near a recession. So, stocks went up. And we’re likely to see stocks keep moving up for some time. How long is anyone’s guess. But earlier this week, we were reminded that political instability has the potential to hammer the market. When news came out that Donald Trump Jr. released an email chain showing he was open to willingly taking information from anyone potentially associated with the Russian government — and that he, indeed, even attended the meeting — the market rumbled for half an hour. There is a lot of debate over whether Don Jr. committed an illegal act. But it strikes closer at the question of whether there was collusion between the Trump administration and the Russians during the last election. That could lead to an impeachable offense. And impeachment isn’t something the market typically likes. 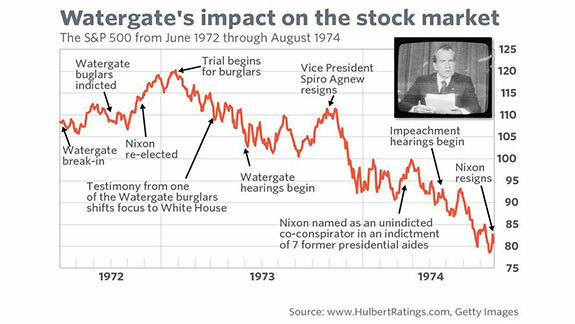 If you just go back to Richard Nixon, you’ll notice that from the time he was re-elected — in a landslide — to the time he resigned, the S&P 500 had dropped 30%. During the Clinton years, we didn’t see the market collapse during impeachment. But from the time Linda Tripp contacted Whitewater Independent Counsel Kenneth Starr in January 1998 to when impeachment proceedings concluded in February 1999, the market had gone up just 7%. That’s not robust — especially for what we were seeing during the dot-com bubble. So, impeachment doesn’t necessarily help the market. 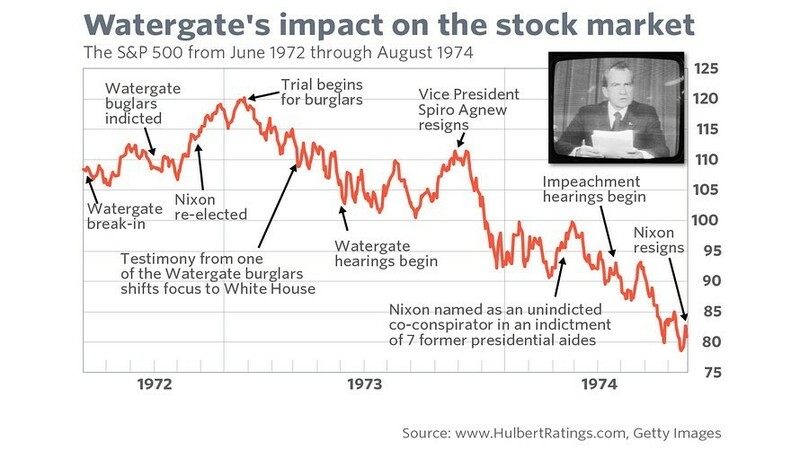 And if there were big economic problems going on, like there were during the Nixon years, then the market can get decimated if there’s political uncertainty on top of it. Which begs the question: Would Trump be impeached? The question becomes: Do we think a Republican-led Congress would impeach a Republican president? When Clinton was impeached, it was by a Republican majority. When Nixon was impeached, it was from a Democratic majority. There is basically no chance that a Republican-led Congress would get enough votes to impeach a Republican president. Plus, it wouldn’t be in their interests to do so. Impeachment proceedings are long and drawn-out. The more Congress focuses on impeachment, the more it takes away from other priorities, such as tax reform or the opioid crisis. If voters put a majority of Republicans in Congress and see nothing get done legislatively, chances are many of them won’t vote next time around. I’m sure that Senate Majority Leader Mitch McConnell and House Speaker Paul Ryan are both aware of this fact. The last thing they’d want to do is pursue an impeachment and throw their whole legislative agenda in the air. I say that chances are, even if it is revealed that the president did, indeed, commit an impeachable offense, Trump will remain in office. Does that mean the instability won’t hurt the market? Of course not. We could see more sell-offs as news hits the wires. And there’s a strong likelihood that we’ll see a recession before Trump leaves office. That would certainly hammer the market, especially if combined with damning political news. That means we should keep a close eye on the political and economic developments as they come in. Right now, the market is extremely expensive … the economy is growing slowly … and we expect a wave of political uncertainty to hit. The last thing we would want to do is become complacent just because stocks are moving higher. For now, if you’d like to see our open positions, simply click here for the ePortfolio. You can get there anytime by logging in on the top right corner of our website, www.banyanhill.com. If for any reason you can’t locate your login information, just click here to access our login helper.